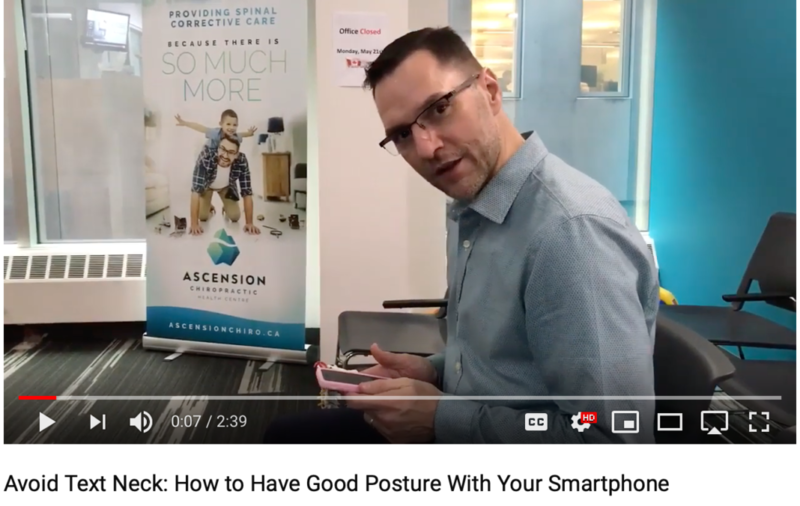 In this video, Dr. Haughton explains what is happening to your spine when you look down at your smartphone all the time and offers some practical tips on how to avoid the dreaded “text neck”. How many of you are texting everyday? Pretty much everybody. We are all familiar with the head down position of staring at a smartphone. This is creating something called “text neck”. Let’s take a look at what is happening to the spine. The neck should have a c-shaped curve. When staring down at your phone, it causes the spine to flex forward. You should know that for every inch of head forward posture, it adds 10 lbs of weight to your head. This adds a tremendous amount of stress to the muscles in your back and neck and puts pressure on the bones. Over time, this will cause damage to the bones, leading to damage to the spinal cord and the nerves that branch off of the spinal cord. This is a serious problem! How can we mitigate this? When texting, bring your elbows to your side (draw them in), and hold your phone up to about chin level. Then your eyes will naturally drop down to the screen without having to bend forward with your neck. If you are a commuter (not driving but a passenger), put your backpack or purse on your lap to prop up your ams and hold the phone up at the proper height. Over time, “text neck” will cause you problems. Stay aware of your posture, think about what your posture is doing to your spine, and start using these tips today! Keep your spine safe and your nervous system strong and healthy.